The warm southern sun produces a bold Cabernet Sauvignon with the varietal’s signature nose: blackcurrants, dark chocolate and subtle toasty notes. Fermentation on GenuWine Winery Dried Grape Skins and toasted American oak produces a full-bodied wine with hints of coffee and vanilla notes. 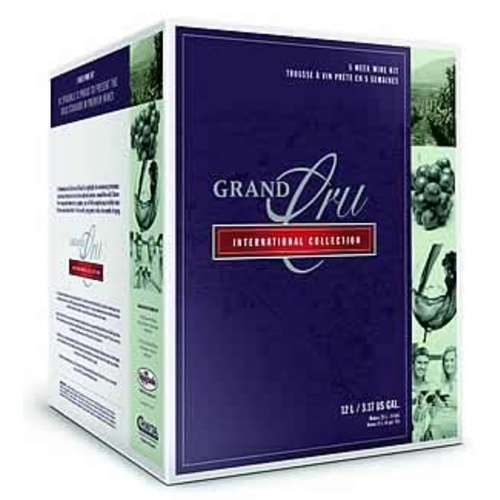 The International Collection of Grand Cru highlights the winemaking techniques and traditions from recognized wine regions around the world. This particular wine kit is a 2011 WineMaker International Award Winner. We've made several of these kits and love the results. Have made it before and liked how it caame out! This is an excellent Cab. Very smooth. I have made several kits with this one and have not been disappointed with the results.